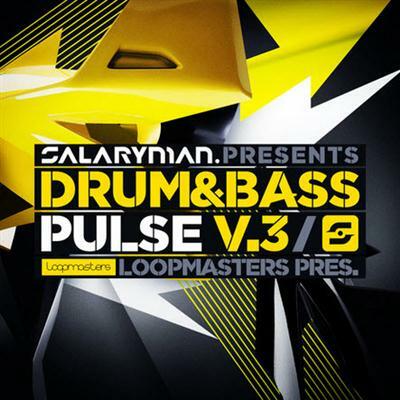 Salaryman: Drum & Bass Pulse Vol 3' is the latest in the acclaimed series from Salaryman, brought to you by Loopmasters. Prepare yourself for an onslaught of rolling bass and cut-throat rhythms from one of the industry's finest. Salaryman has established himself as one of the best Drum & Bass producers in Europe, with performances alongside DJ Hype, Pendulum, DJ Fresh and Shy FX amongst others. He entered the world of production to develop his own approach to Drum & Bass, blending elements of Hip Hop, Techno, Trance, Breaks and Jazz. His tracks are supported by the biggest names in the scene, frequently aired on national radio and reaching the Drum & Bass top seller charts. Salaryman: Drum & Bass Pulse Vol 3' contains 1.3 GB of content with loops, hits, MIDI, sampler patches and VST presets. The loops include sizzling bass, sharp drums, lush atmospheres, beastly synths, fills and percussion, all tempo synced to the beat. Over 360 one-shot samples are included with bass, drums, FX and synths in addition to 18 bass multi sampled instruments and five multi sampled synth instruments. With 72 sampler patches ready to be dropped into your projects, you have a wealth of inspiration straight out of the box. Soft synth presets are included for Serum and Massive, and over 60 MIDI loops bring you sequences to tweak and mutate in your DAW. This third instalment leads from where Volume 1 and Volume 2 left off, and is set at tempos from 170-175BPM - making it ideal for Drum and Bass, Jungle and other hi-octane genres. Salaryman delivers another knockout punch with a pro-edge Drum & Bass collection to shake your musical foundations. Check out the demo above, and download the free taster pack today.